A VALBY® Grapple will turn your excavator, backhoe or telescopic loader into an Efficient Loading Machine!. Grapples have far more dexterity than a bucket and thumb. 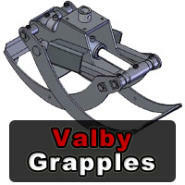 VALBY® Grapples are also available as attachments for skid steer loaders, or even mounted on a tractor 3 pt hitch. VALBY® Log Grapples are the perfect choice to replace old-style pinch grapples on log loaders. VALBY® Bypass Grapples grab logs tightly, helping you work fast but stay safe. We have many grapple styles available, including Log, Universal/Stone, Sorting/Waste, Demolition and Clamshell Buckets. Click on any grapple category listed below to see all of the options in that category. 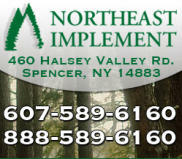 For more details on what we offer check out the products page. 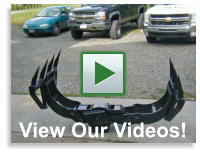 Also be sure to check out our videos for a better look at our products.